Or maybe I’m actually paraphrasing via my self-deprecation filter. Ahem. It was probably more like a gentle, personal, encouraging call out suggesting I write a little something something in the month of December. The truth is, I’ve written lots and lots and lots of words since my last post. They’re all sitting there as drafts. Four, pretty much complete, thousand word drafts. So it’s not really writer’s block that I’ve got going on. Rather, it’s more like writer’s disdain. I’ve got lots and lots of words — I just hate them all. Writing has always made me feel so good and it’s still cathartic, but not the positive release I’m used to. The words I’ve put down on the page don’t feel together, with it, insightful. They don’t feel funny or clever. Not even clear. That makes me exceptionally sad. Depression and grief have taken so much already — my light, my exclamation points. My words too? It’s too much! So Kacey is right. It’s time to put something back out there. I went back to the fertility clinic for a post-IVF, post-miscarriage, here’s-what-we-learned consultation. The verdict: the chances of us having children, even with IVF, are exceptionally low. … also, I emailed my girlfriends in DC to see if they wanted to run or just hangout while I’m there to run and they were AMAZING. I’m so lucky to have them. They are so good for me. … and I was reminded that no matter how much my anxiety/depression tells me I don’t want to be around family, that I’m not good enough, pretty enough, pregnant enough to even deserve to be in their presence — I freaking love them and it was really amazing to spend time with all those Voncks back in the yoop. My grandfather passed away and I was so sad, but his legacy, the family he built on rock, is a good and beautiful and powerful thing. Seven relatively brief points. That’s better. Delete, delete, delete the drafts. That’s what’s been going on and I’ve mostly just been feeling down about all of it, even despite the good bits — the family and friends, support and love. Because depression is kind of like that. 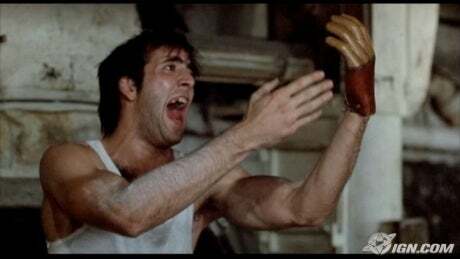 Then, yesterday, after I saw Kacey’s public slam (except not really), I was talking to my friend Marie and, because our conversations always take wild and weird turns, she told me about a super bitter guy who never got over losing half of his hand in a factory accident and I instantly imagined him as Nicholas Cage playing Ronny in the movie Moonstruck. I love the movie Moonstruck so ridiculously much — I mean, it’s kitschy (Marie’s perfect word!) and ridiculous and Cher-filled and perhaps Nicholas Cage’s poorest acting ever, but OMG, I cannot help but LOVE it. And my little chat with Marie and the knowledge that Seth’ll be out and about policing the good city of Marshfield Friday and Saturday night settled my plans to stream Moonstruck at least once over the weekend, probably with popcorn and some cider and a pup to snuggle me. Yes, this sounds quite good. I don’t want to be that person. I really, really don’t want to be that person — spending the rest of my life bitter over my missing limb. Granted, depression, sadness, grief… none of that is the same as bitterness. But I think it could be a gateway, so to speak, if I don’t keep working on myself. Keep looking for the positive, finding ways to expose myself to light and love and goodness, to let it come in through the cracks. Bitterness would probably be easier, born of non-action, but it won’t end as well for me as it does for Ronny. I choose to work for the alternative, even when it’s hard. And maybe that’s what the commitment to 26.2 miles is, the email to my friends even though many of them are the “every single other woman my age” that bitter-Ronny-me could end up ranting and raving about, the time spent with family despite the panic in my chest on the way. But it’s also gentleness — because life is hard right now, I did lose a limb, and that doesn’t heal overnight. I can only bend so far without breaking, but even slow progress is progress. Or so my yoga instructors tell me (that’s point 8 — it was another thing I wrote about). Turns out, he wasn’t the first one to say something like that. Ernest Hemingway said, “We are all broken, that’s how the light gets in.” And Sufi mystic Rumi said, “The wound is the place where the Light enters you.” That’s a lot of pretty wise people — Muench, Cohen, Hemingway, and Rumi. My job, as a person full of cricks, cracks, and crevices then, is to expose myself to as much light as possible, even when it’s hard, when it’s blinding, and when it’s faint, if I want to avoid the bitterness that can creep in otherwise. Right now, that means running and yoga, family and friends with self-respecting gentleness, and, as Kacey was right to point out, Under the Tapestry too. thanks for hanging in there with me and for being a source of light, always. Congratulations on making it all the way to the end of this post! You’ve earned a bonus photo! do you remember trying on a dress you picked out in the store and that moment when you realized it was actually culottes and not a dress? I was tricked a lot (and during my formative years!). I know I owned at least a few of those– don’t feel bad! OMG Rachel, how many times did you watch Emmet Otter’s Jug Band Christmas?? I always thought your looked cute, even in culottes, with mushroom hair!